Get your very own retro action figure from The Bride Of Frankenstein! ReAction Figures, (short for Retro Action), is a new line of action figures made in honor of classic action figures of the 1970's and 80's featuring iconic horror, sci-fi and other pop culture characters. 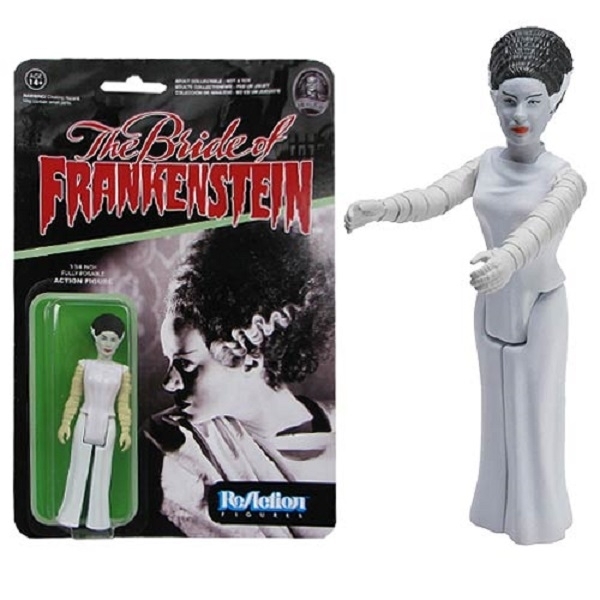 This Bride of Frankenstein ReAction Retro Action Figure features The Bride, aka The Monster's Mate, as portrayed by Elsa Lanchester in the 1935 classic. Measuring 3 3/4-inches tall, it features five points of articulation, it has the look and style that harkens back to action figures made by companies like Kenner in the 70's and 80's!